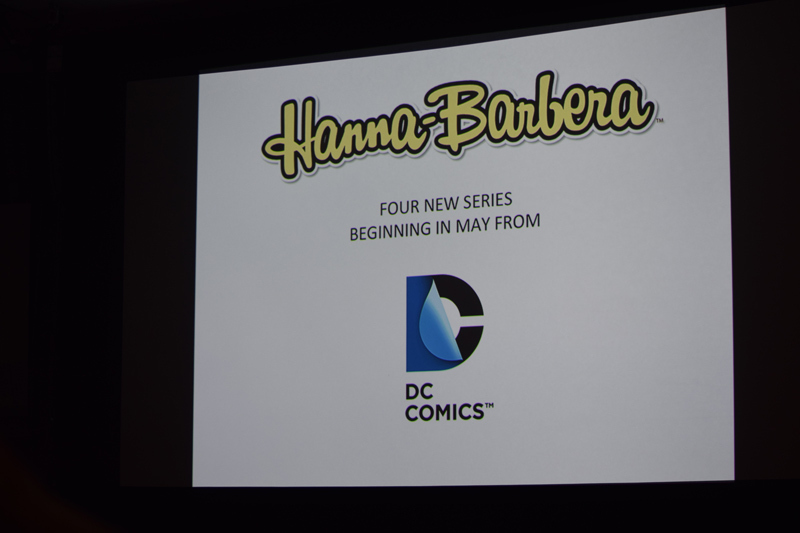 One of the WonderCon panels that I was very excited to go to was the DC Comics new Hanna-Barbera line of comics that starts in May 2016. 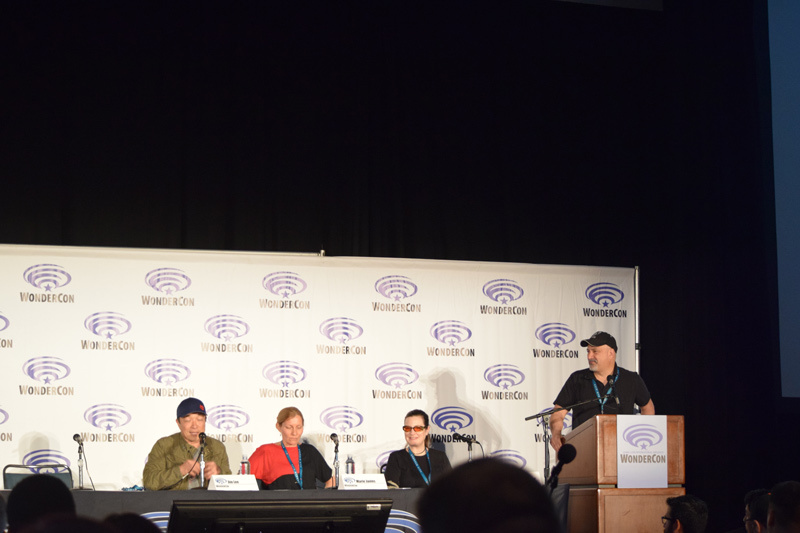 The panel included Co-Publisher’s Dan Didio and Jim Lee, Line Editor Marie Javins, and Amanda Conner. 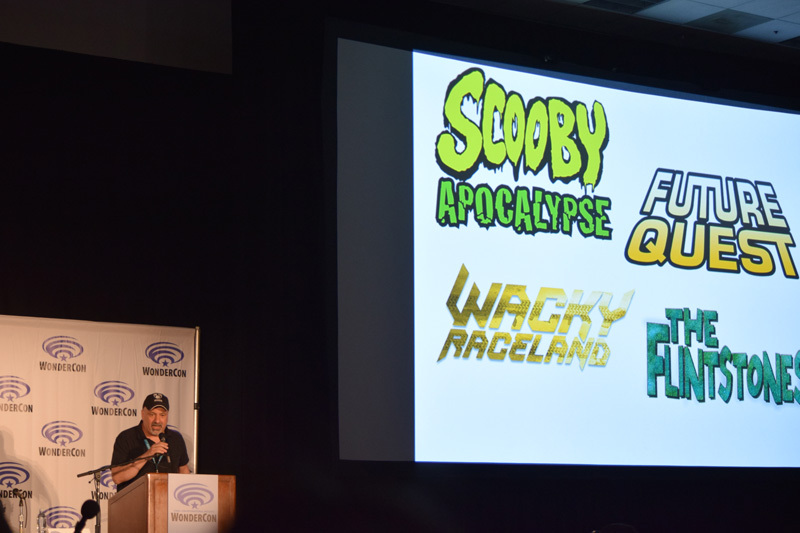 Dan Didio started off the panel with a little background of how the reinvention of the Hanna-Barbera line came about. 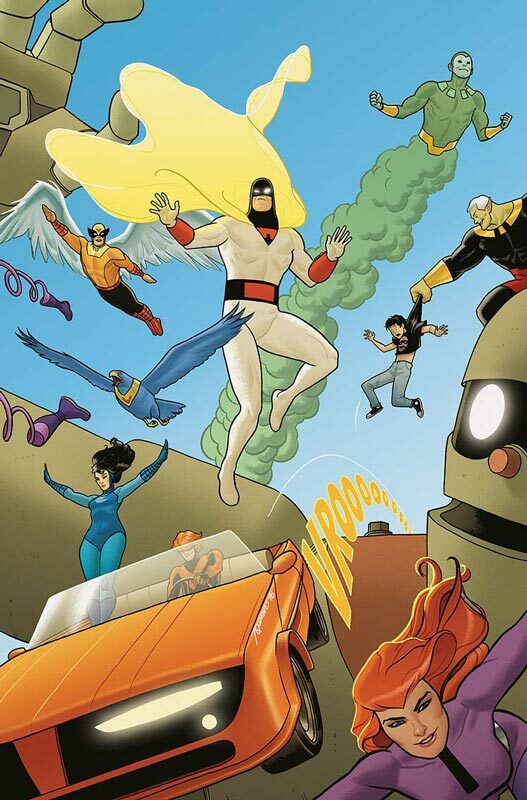 He said that it goes back to his and Lee’s love of the classic Hanna-Barbera cartoons and they wanted to do comics that could capture a new generation of fans and yet still be true to the original creations. 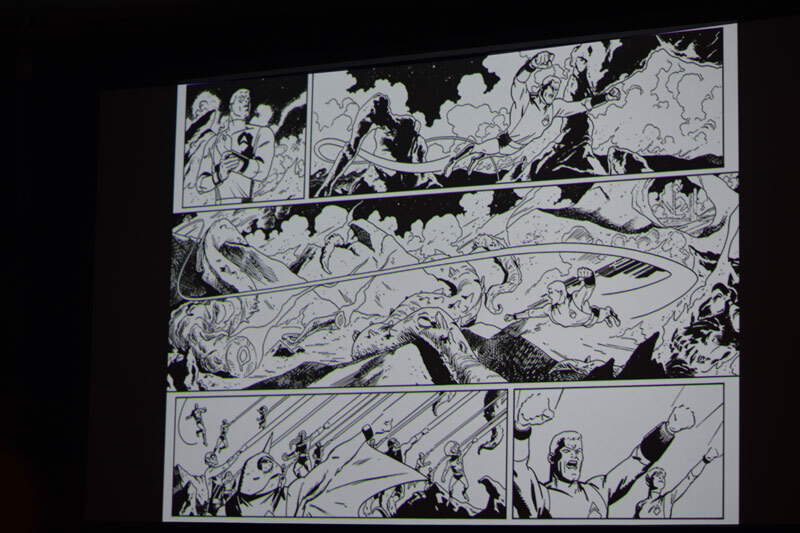 He said that the success of Archie Comics Afterlife With Archie was a big influence on the creation of the books. 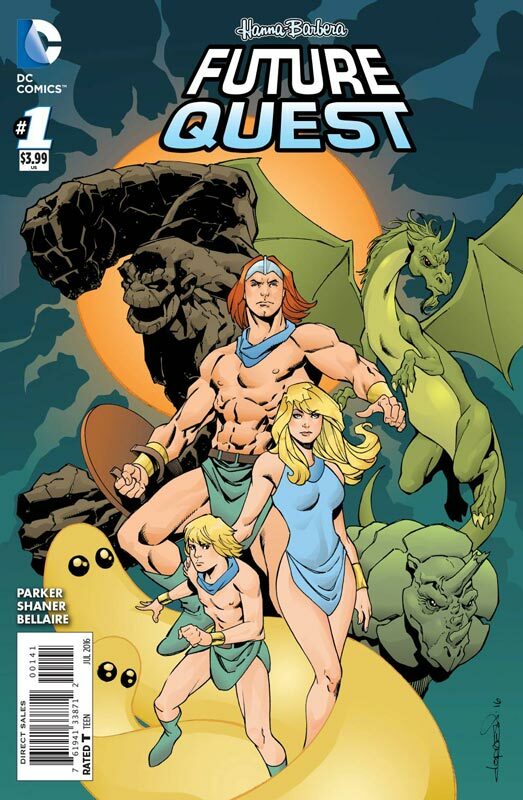 The one thing that he was very adamant about was that the current all ages Scooby-Doo comics and others would still be published and they might consider doing more all ages Hanna-Barbera comics in the future. 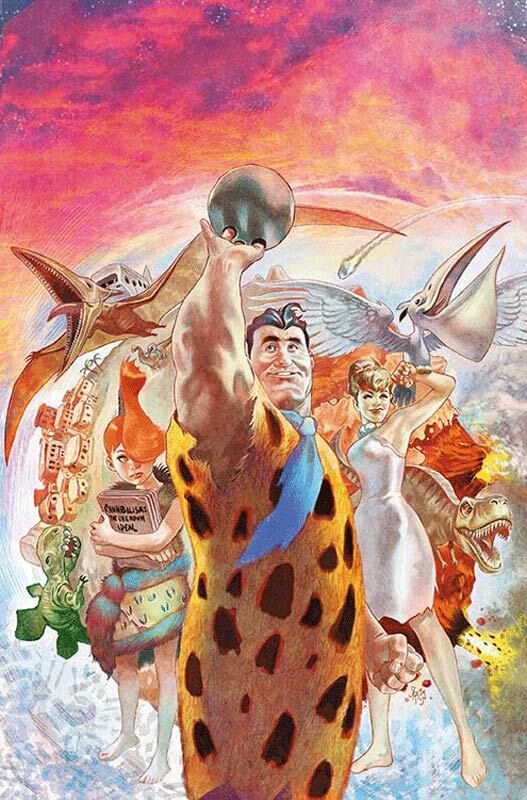 These more adult themed books are going after a different audience and the hope is that if the first books are successful they have the rights to the entire Hanna-Barbera library. 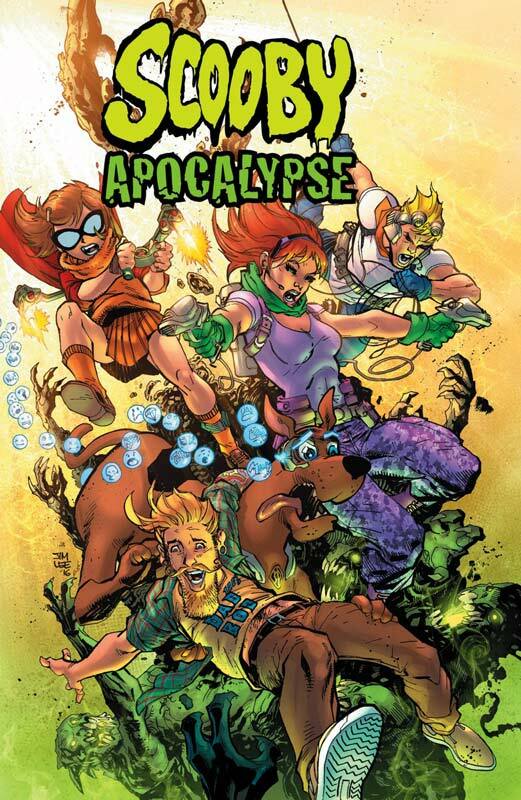 Lee described his concept of Scooby Apocalypse. 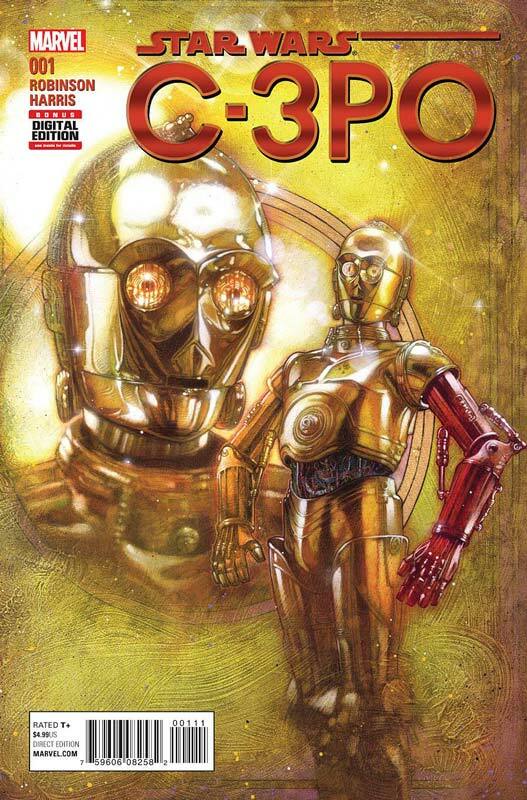 He wanted to make the book be aimed at a bit older audience. 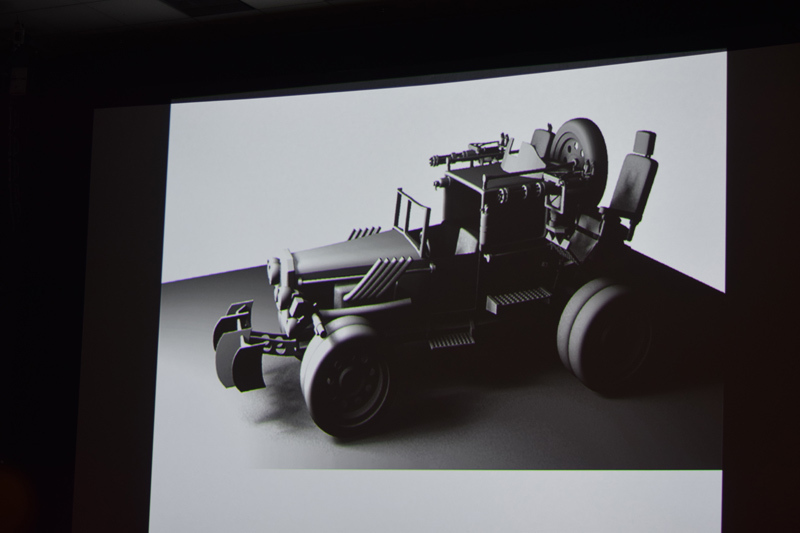 He was always curious about the characters back stories that was never done in the original animated series. 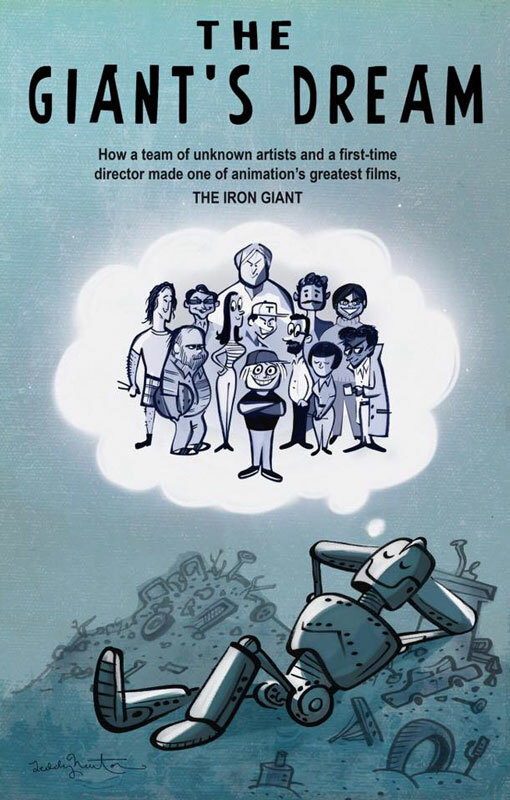 He described the book to the television series Lost where there are flashbacks that show the characters past that intersect with the other characters in unusual ways. 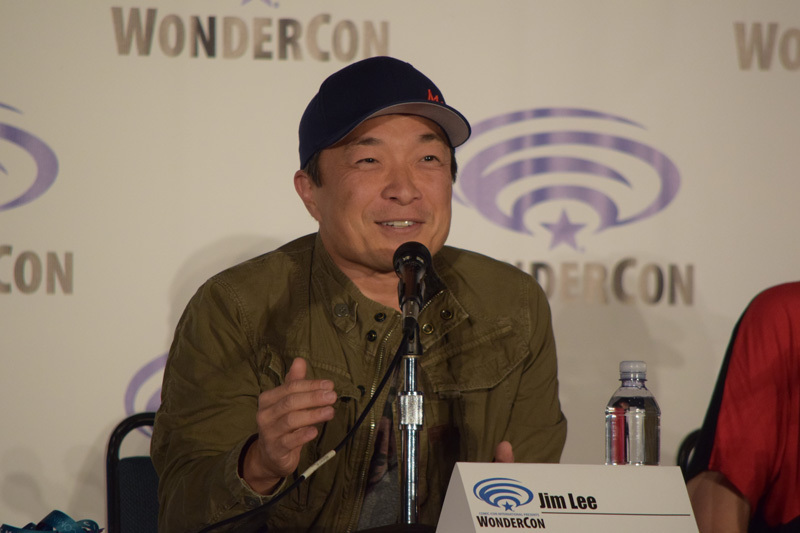 Lee said that his daughters were big fans of the original show and that they would watch it together. 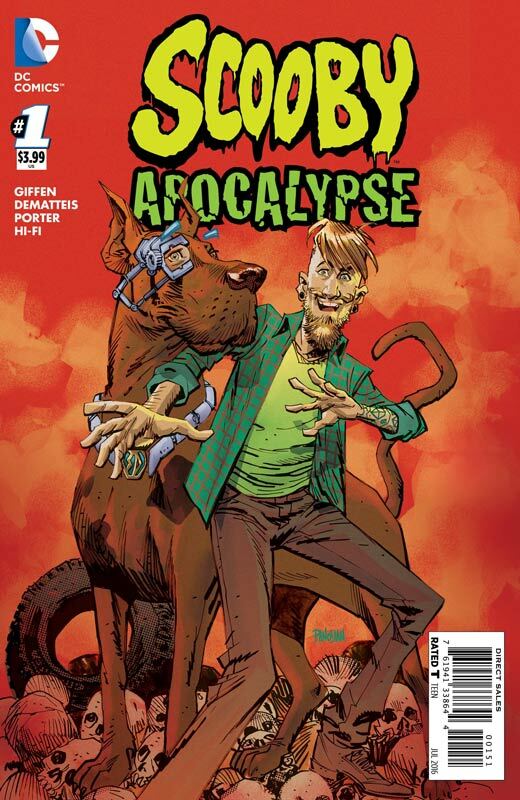 He wanted to make the book that could bring a new generation to the Scooby-Doo universe and bridge the gap of readers that wouldn’t buy the all ages books but hope that they might pick this one up. 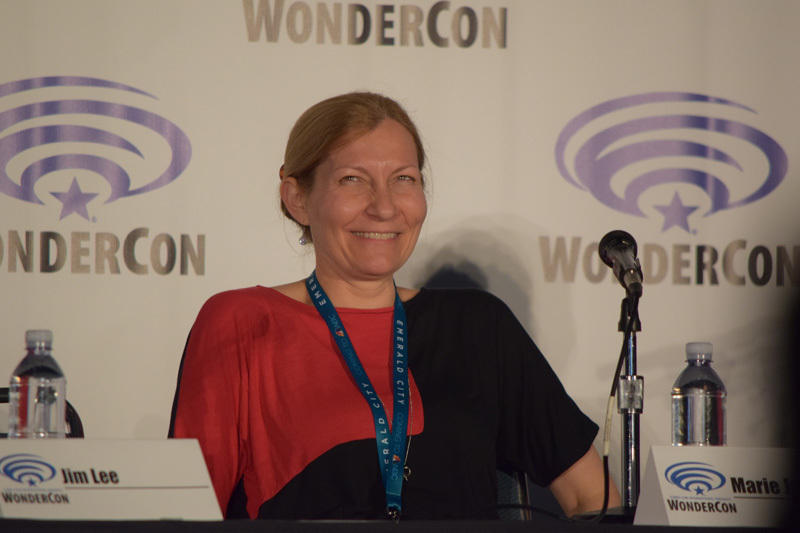 Lee went on to describe the storyline of the book so there are SPOILERS AHEAD, so if you don’t want to know about the series then skip over the following. 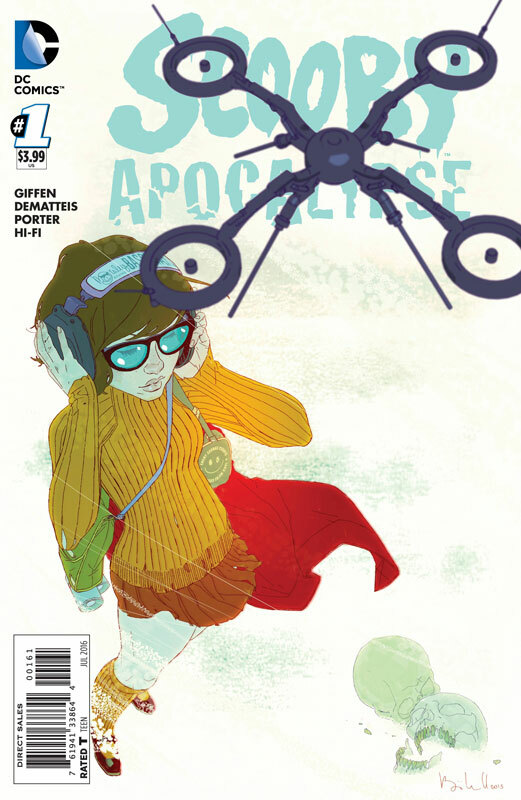 The story starts at Burning Man festival where Fred and Daphne who are former YouTube sensations and now have a Mythbusters type reality show where they try to find and debunk ghost sightings. 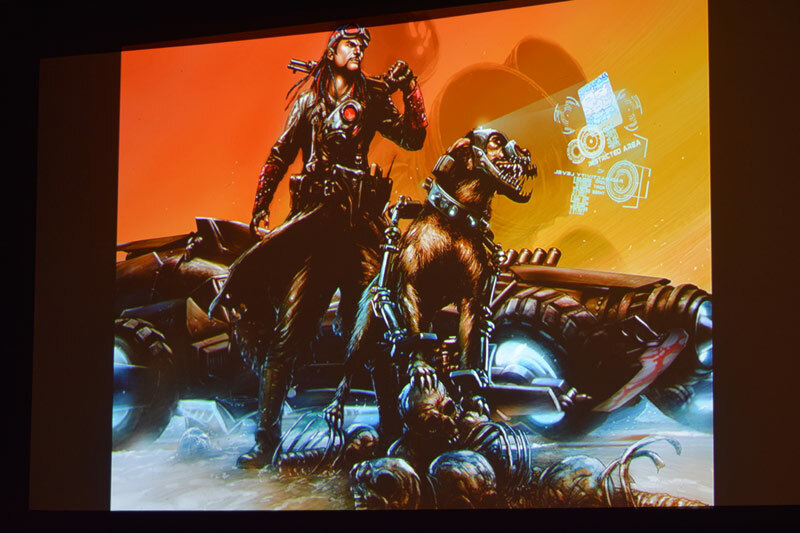 They heard that werewolves were at Burning Man, so they spend the last of their money to go uncover the truth. 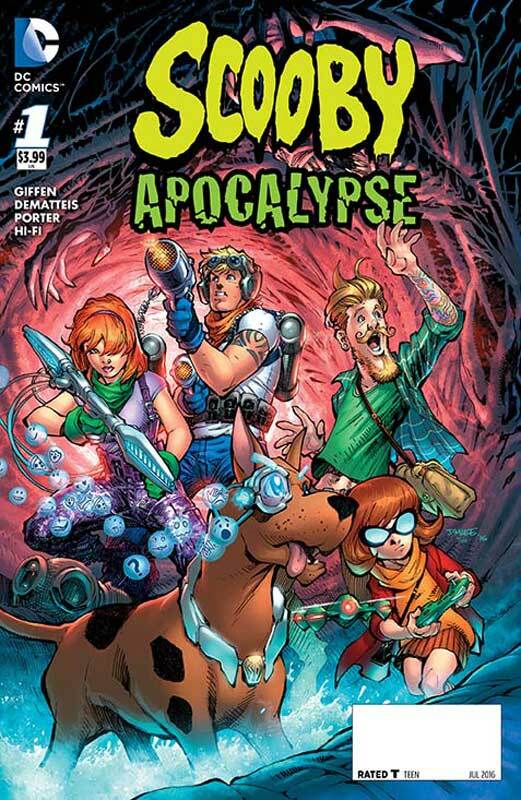 They of course stumble onto a secret government Think Tank in a hidden facility underneath the desert, where they find Velma. 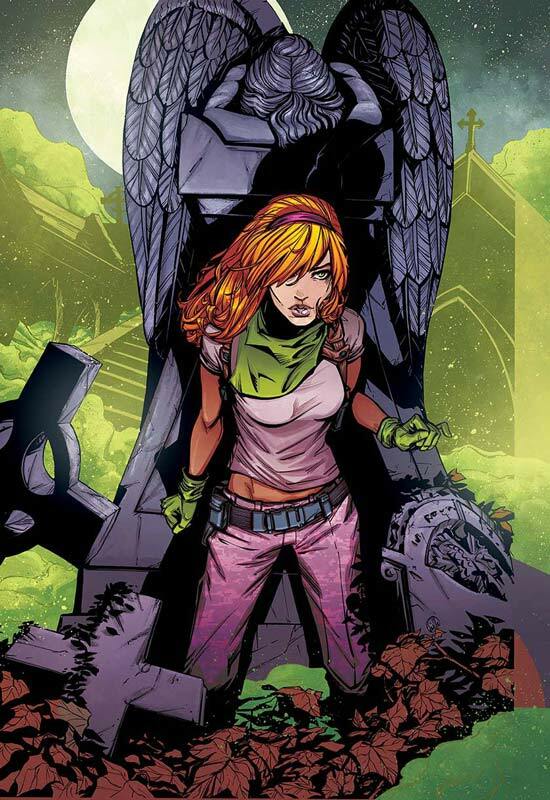 She’s one of many millennial who were recruited to work on a secret project. 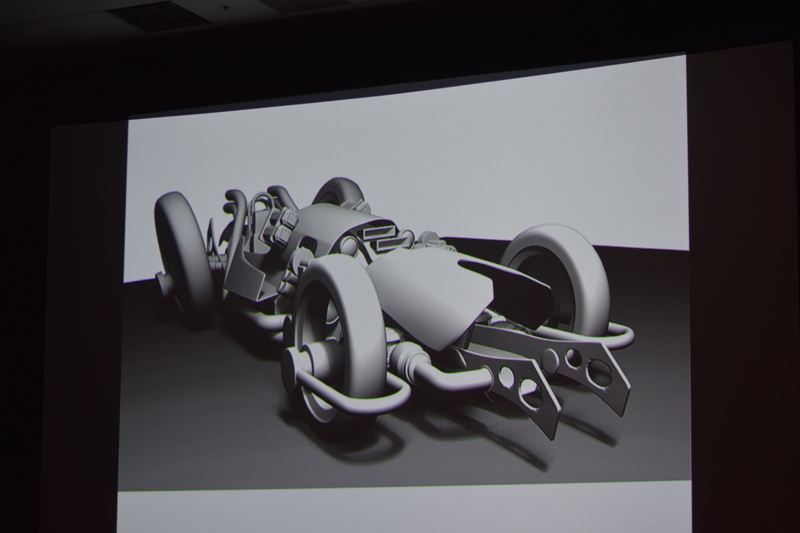 It’s a nanite-virus that will infect people’s brains, and at the touch of a button they will become more altruistic and good-natured. 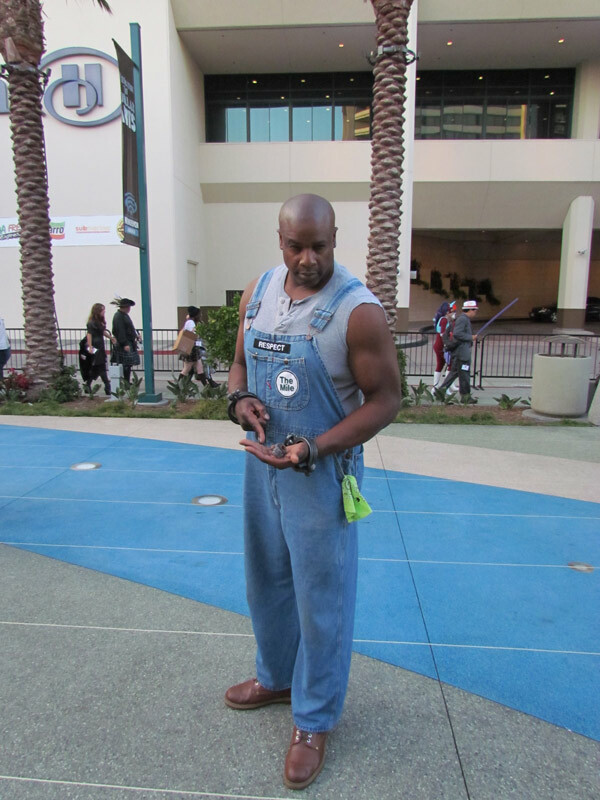 Lee said that then everything goes awry when the millennial’s who are always used to getting a free pass on everything, don’t end up checking their work and then the nanites do the exact opposite. 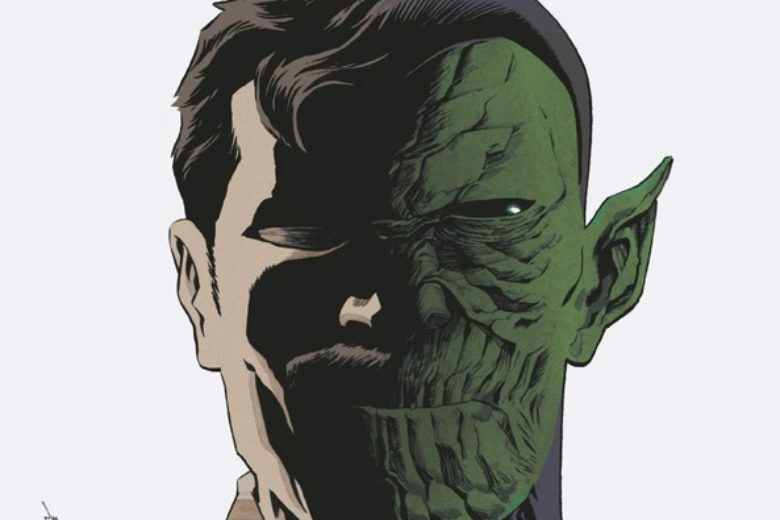 They start pulling out the worst in people’s personalities. “Hence Donald Trump,” Lee joked. 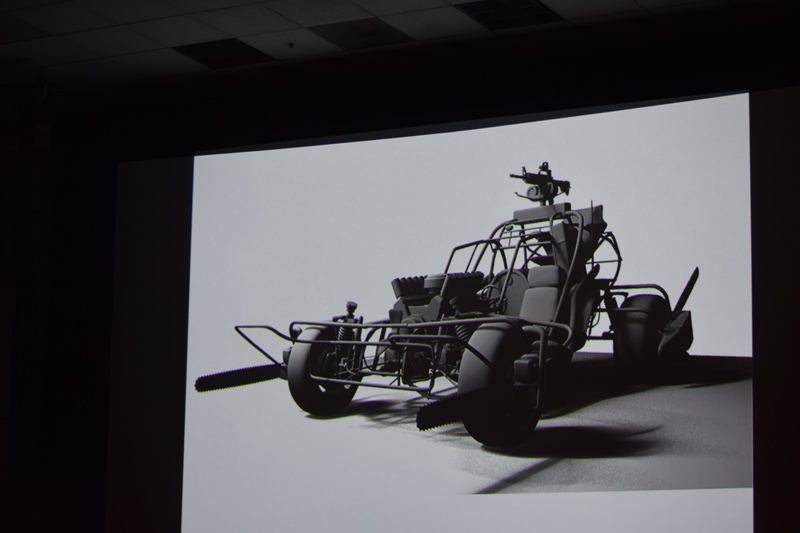 Those infected people transform and run amok in Burning Man. 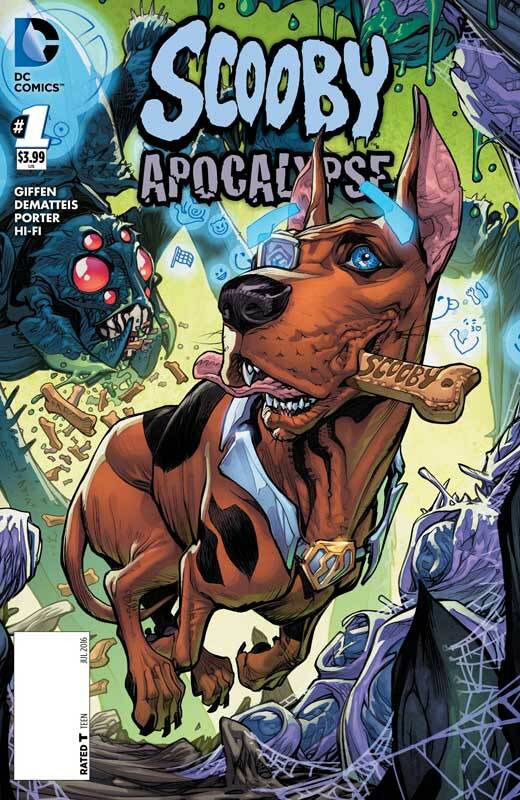 Scooby Doo is a dog being experimented on in a lab, and thanks to a device on his head, he communicates through emojis that pop up out in tiny bubbles. 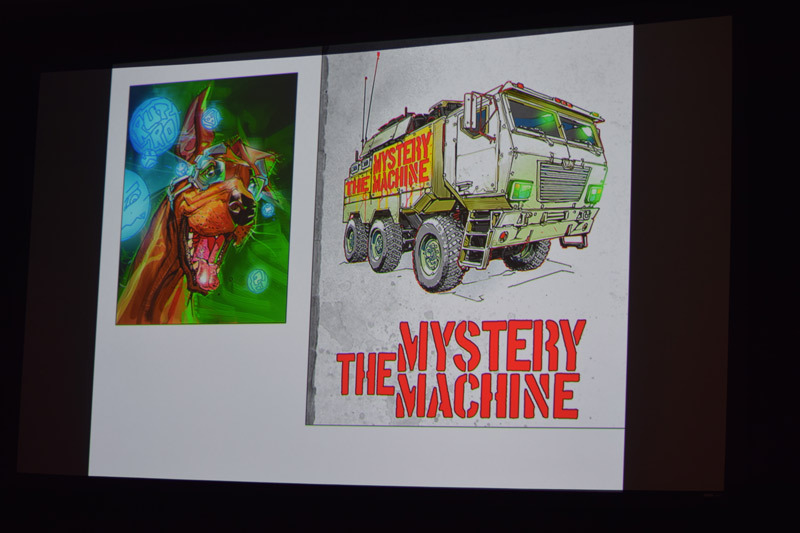 So that’s how they are able to get around the communication barrier with Scooby. 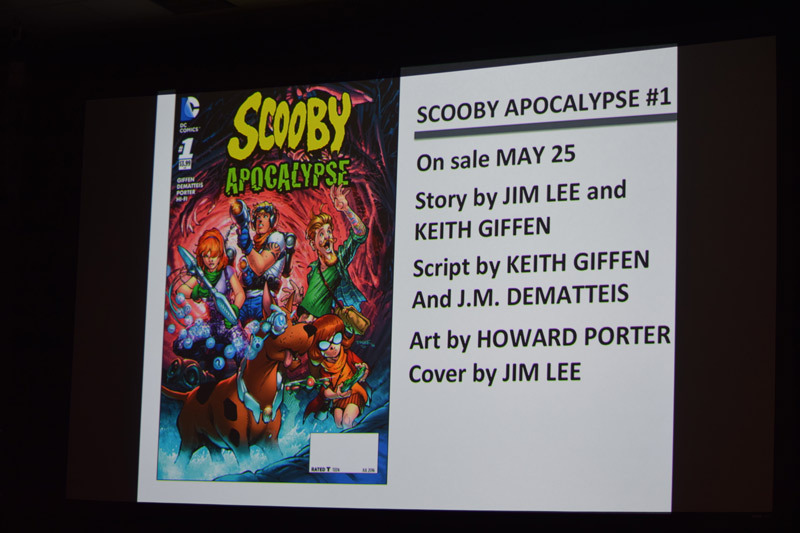 Didio said that artist Howard Porter was offered any book in the DC line and he choose to do Scooby Apocalypse. 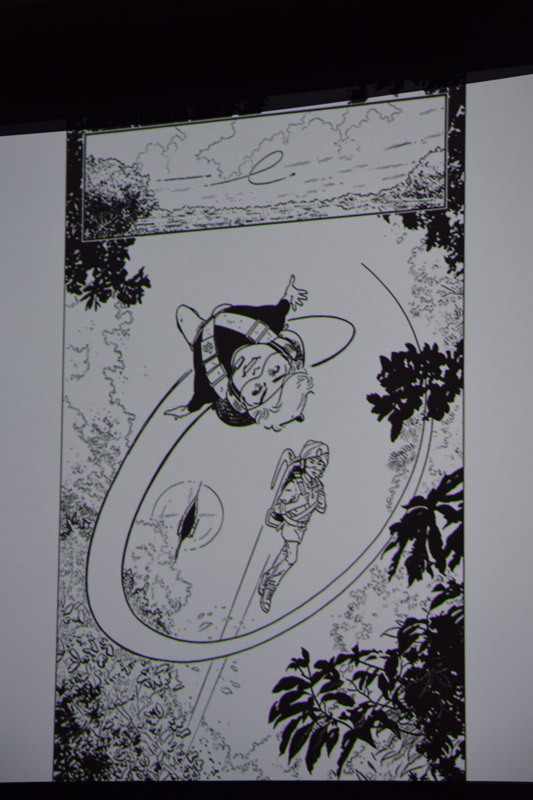 He said that they have a long list of creators that want to either do books or in the case of artists that want to do covers for the various books. 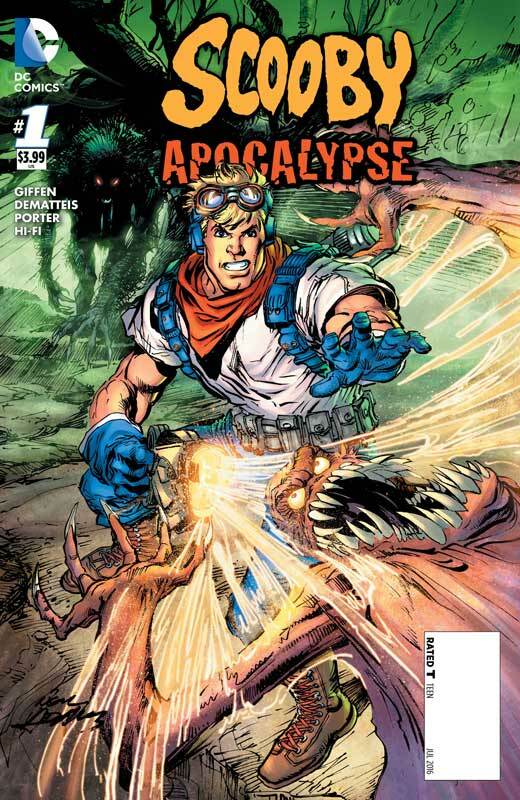 Writer Keith Giffen and Lee were having a great time with the scripts on the book. 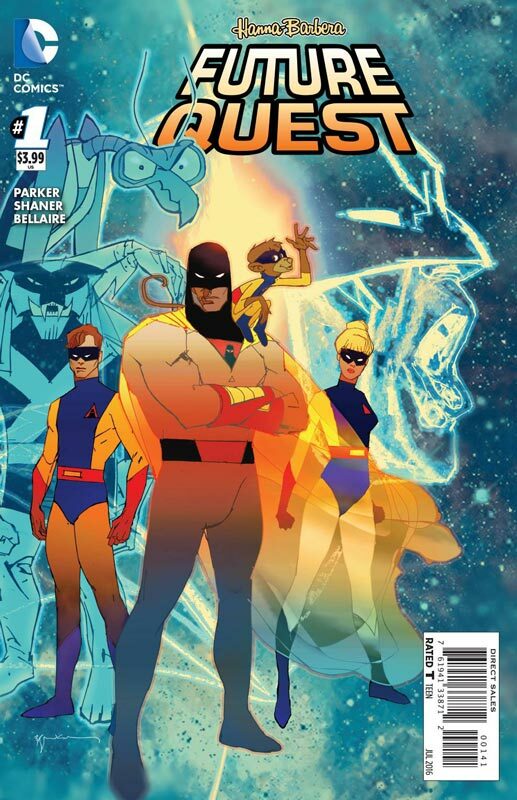 Future Quest was the book that everyone has been talking about. 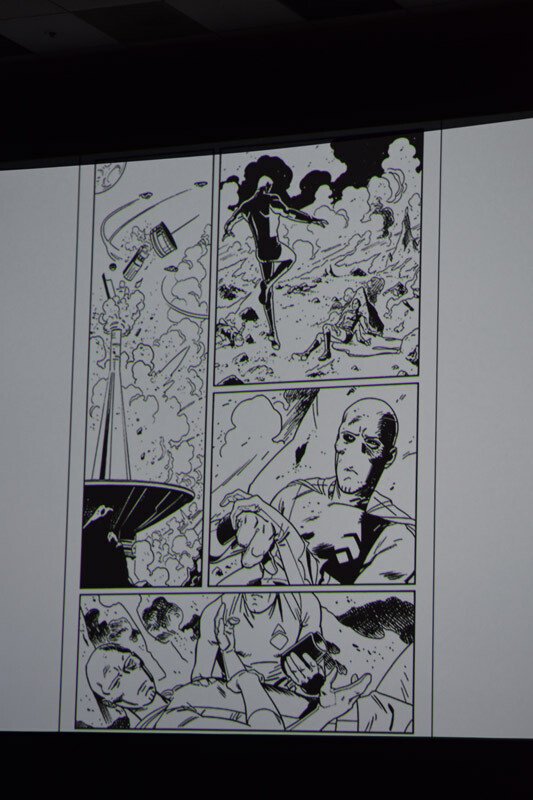 Didio said that Writer Jeff Parker and Evan “Doc” Shaner were born to do. 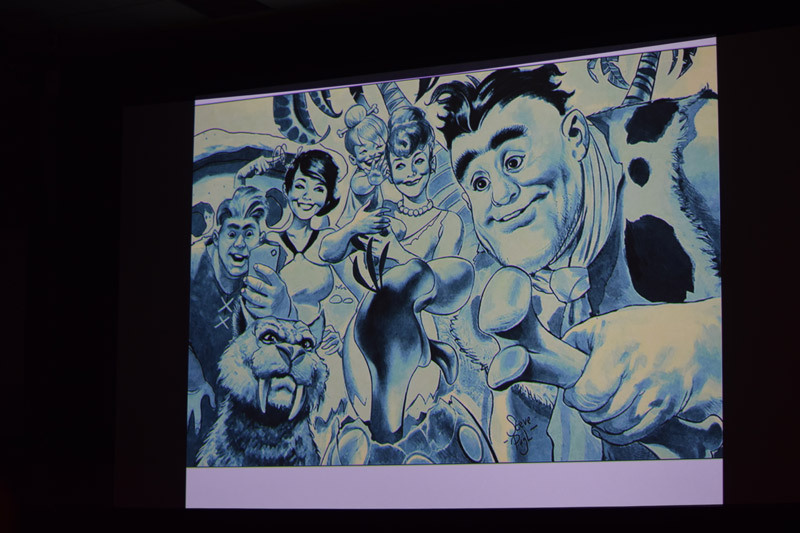 He said that they were huge fans of the Hanna-Barbera superhero series and it was a dream come true for them. 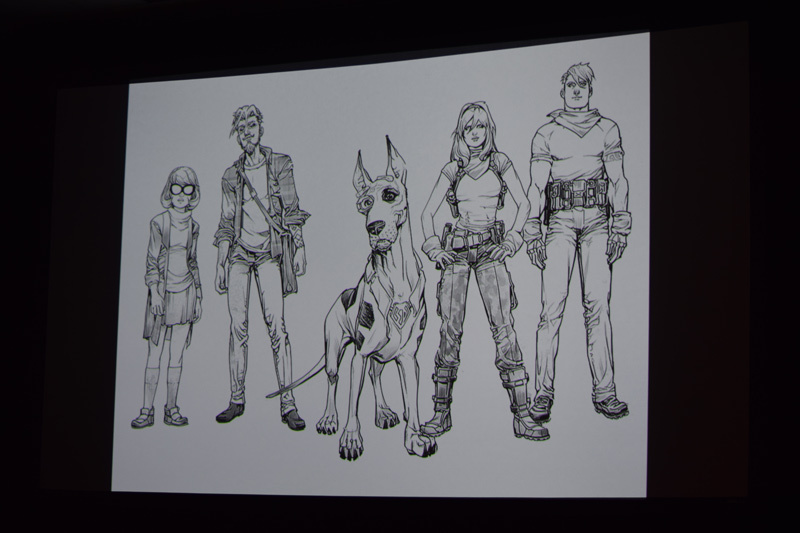 Like Scooby Apocalypse the book will introduce the characters untold past in the book. 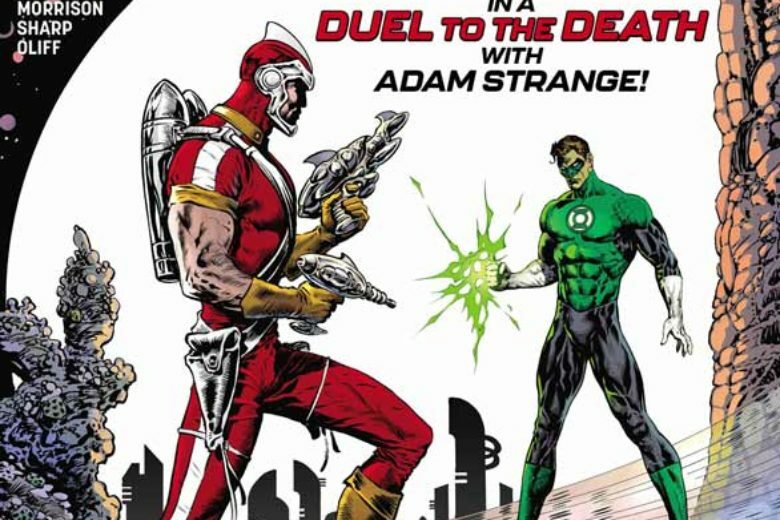 Didio said that a threat pulls the many characters and teams together because something is destroying planets and galaxies, so they’re all headed to earth to make their last stand. 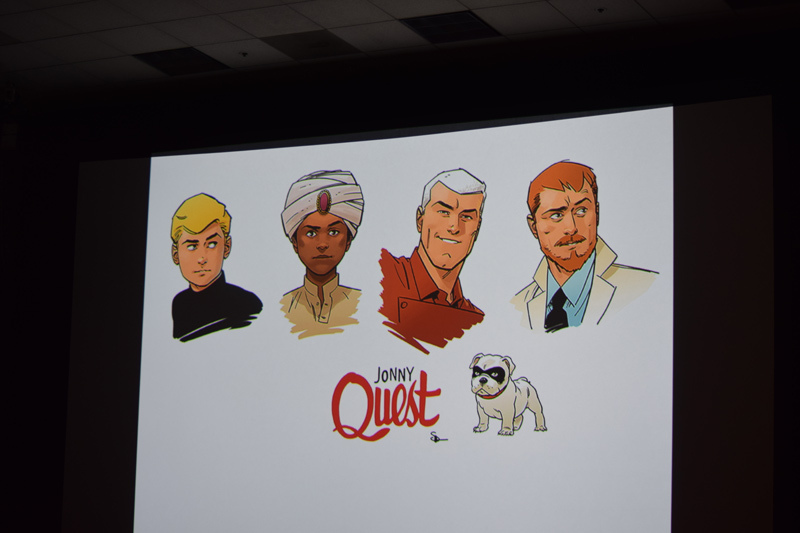 The characters leading the charge for that last stand are Jonny Quest and Hadji. 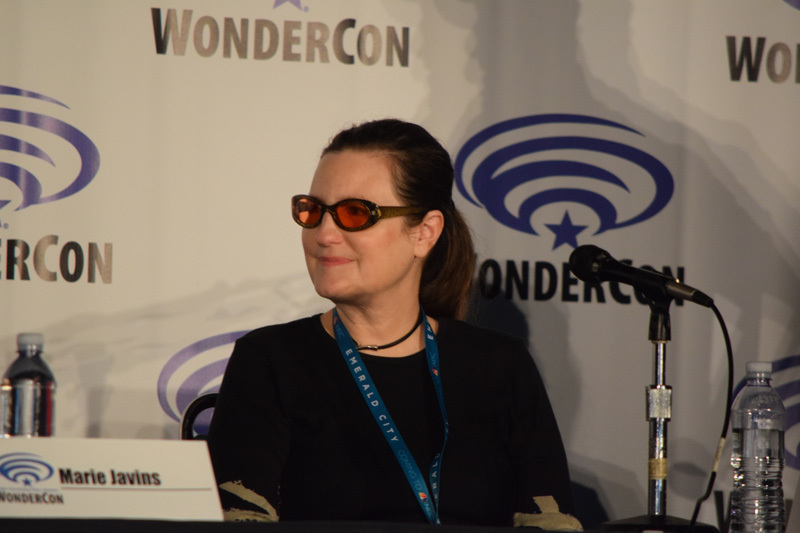 Javins noted that while the story takes place on earth, there will be flashbacks showing how other characters fought the galactic menace and were forced to flee to earth. 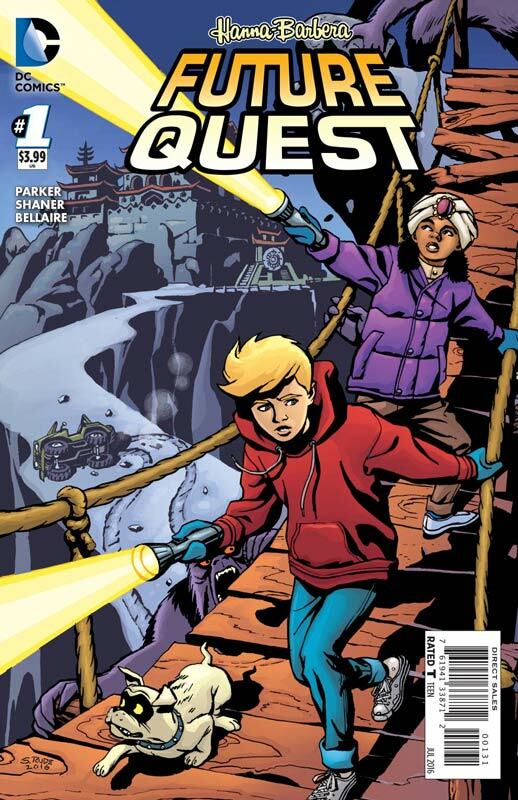 Didio was really excited about this book and they went back and looked at the Jonny Quest run of comics from Comico back in the 1980’s for inspiration for the book. 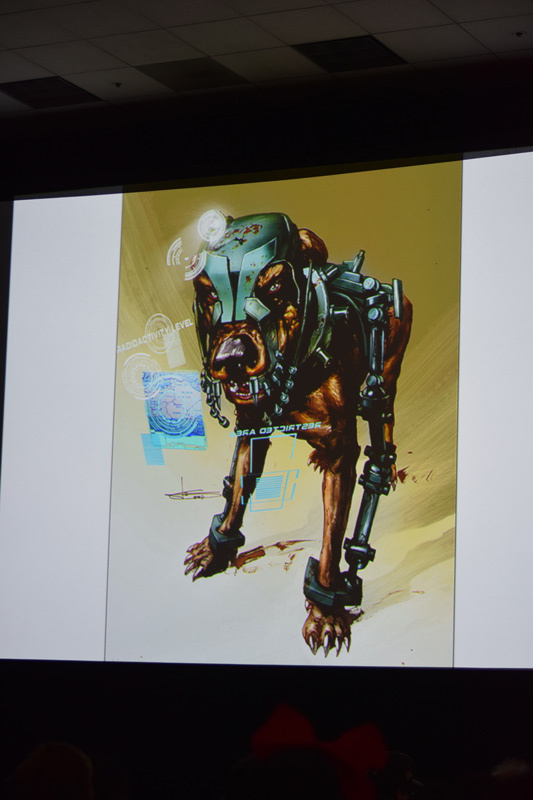 Didio said that this was an epic spanning story that everyone is going to love and have lots of action and adventure. 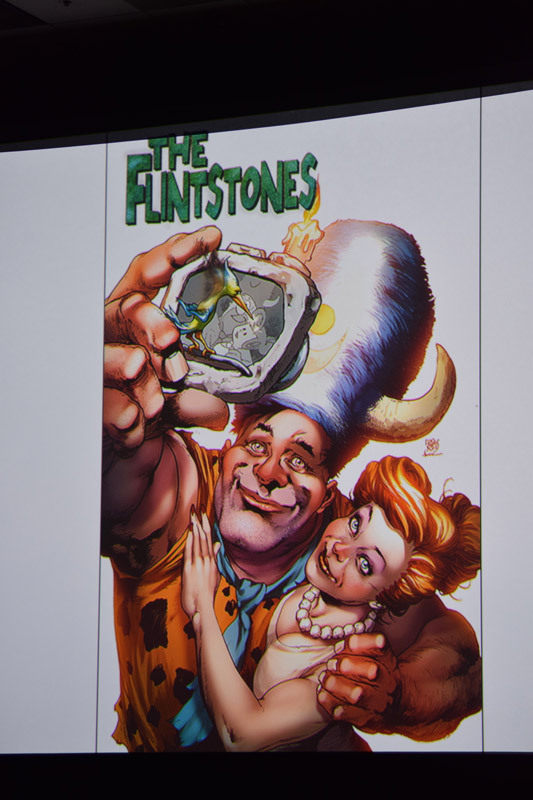 The Flintstones was a big choice for one of the first set of books. 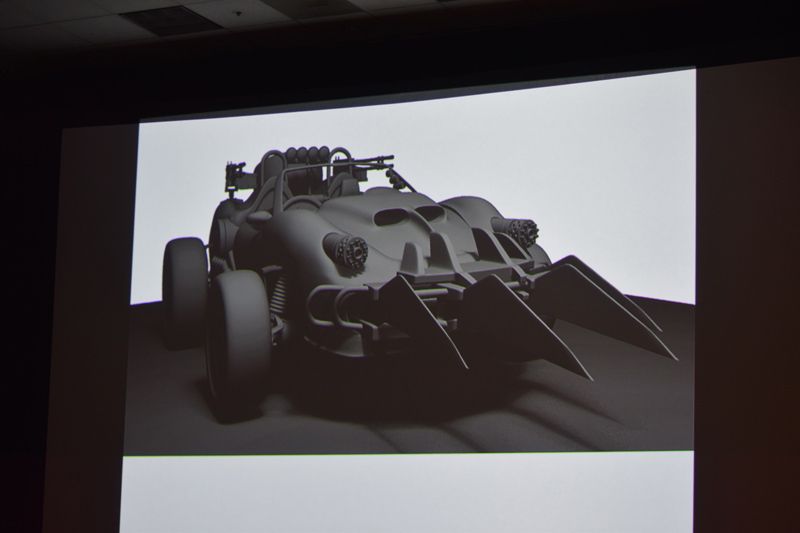 Conner (who only did the promotional artwork, some concept ideas and some character designs but will not be working on the series) said that she wanted to show everyday things that you couldn’t show on TV made for kids, like having to hit a saber tooth tiger on the nose with a stone newspaper when it tries to eat Pebbles, or what Barney has to deal with when Dino takes giant dinosaur craps on his lawn. 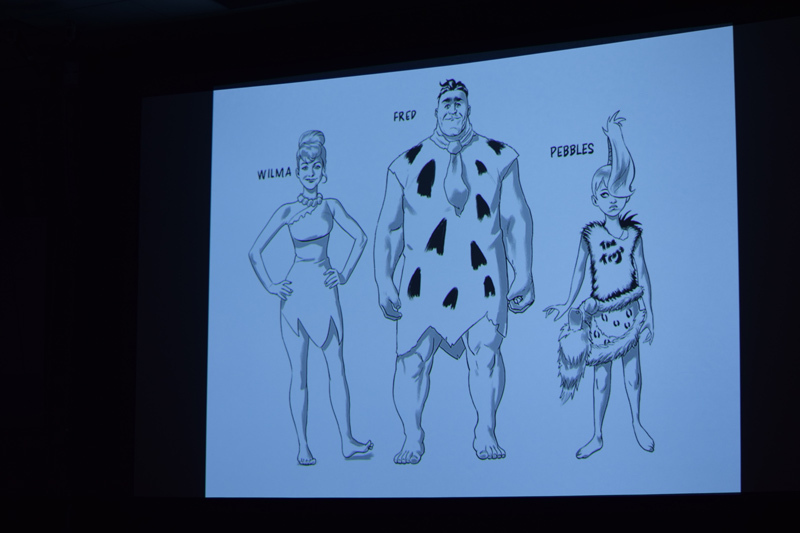 She said that her designs for Fred and Barney were inspired by Kevin James and Patton Oswalt. 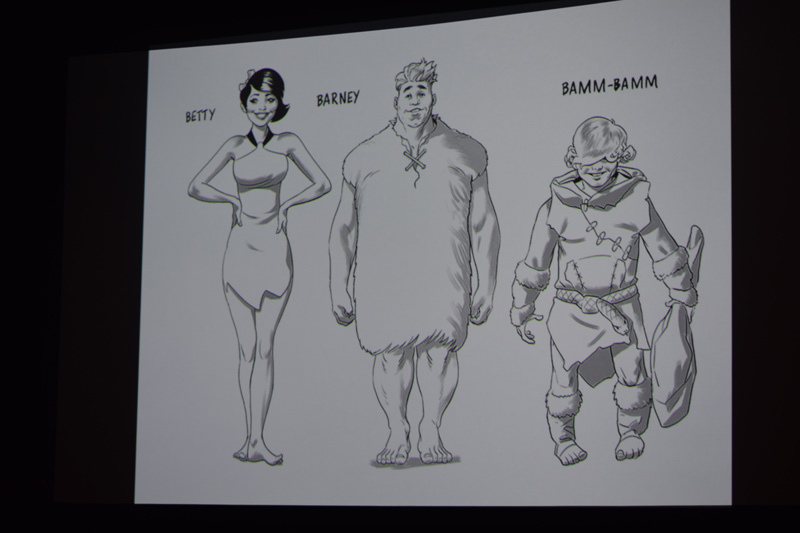 A more grown-up version of Pebbles was shown, so instead of a baby, she’s 12 or 13 and Bam-Bam was around the same age. 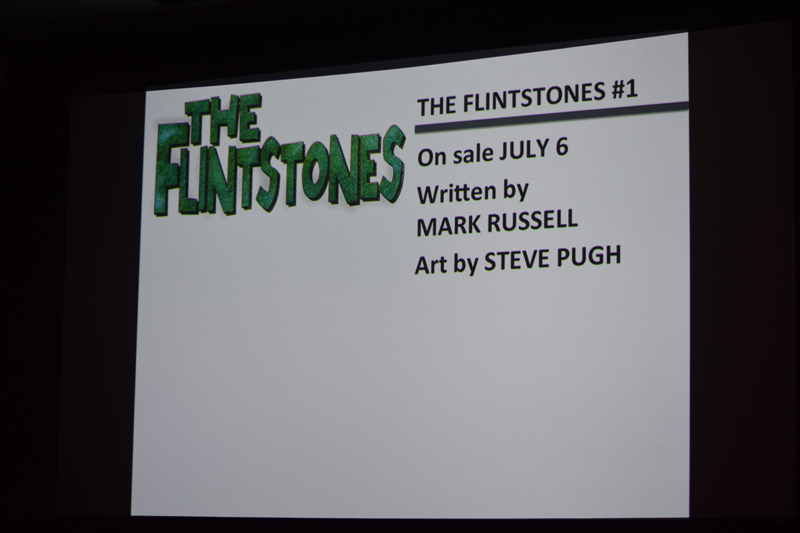 Didio said that writer Mark Russell who had written Prez (he then asked the audience how many had read the critically lauded book and there sadly was not many but he did promise that the second half of the story was going to come out this fall and that the trade for the first six issues was out now and should go and pick it up.) 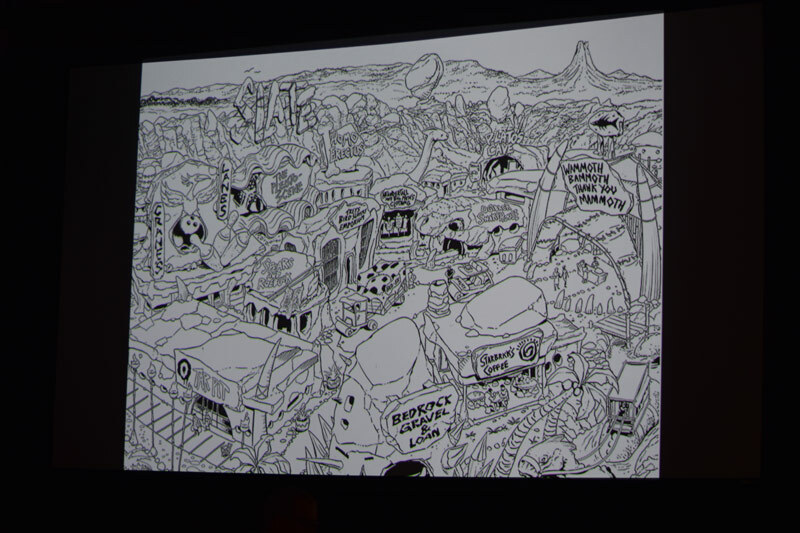 had really come up with some amazing story ideas and artist Steve Pugh had been doing some really great artwork that he showed off. 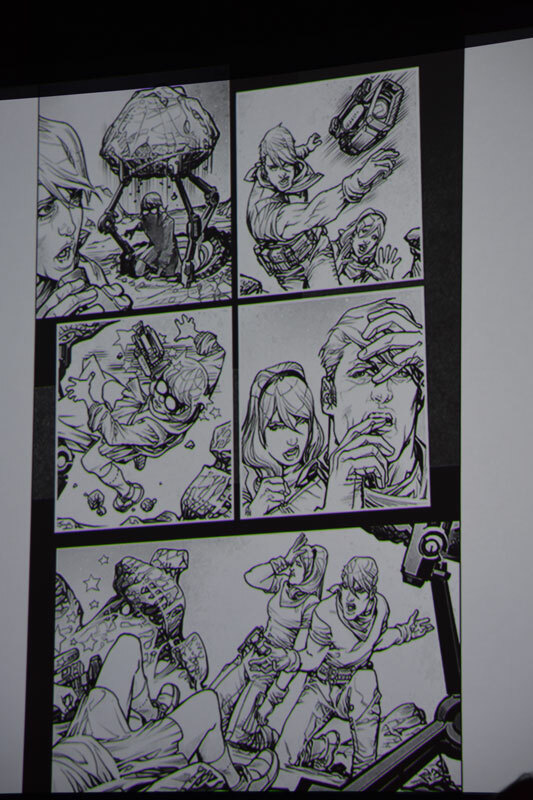 He said that Pugh was excited to do the book and that has been the story for all of the books. 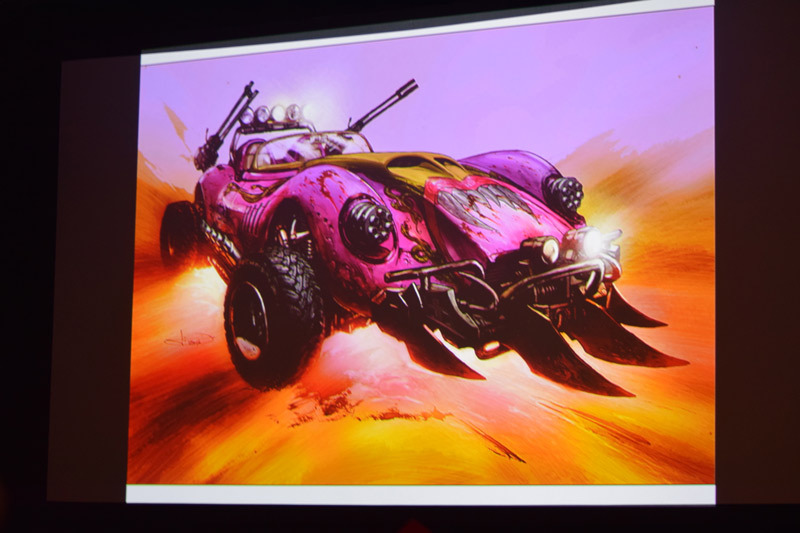 Wacky Raceland was the book that Didio said “that kind of got a bit away from us” with the progression of the concept but when Mark Sexton who was a designer on Mad Max Fury Road showed the concept drawings off to them they just went with it. 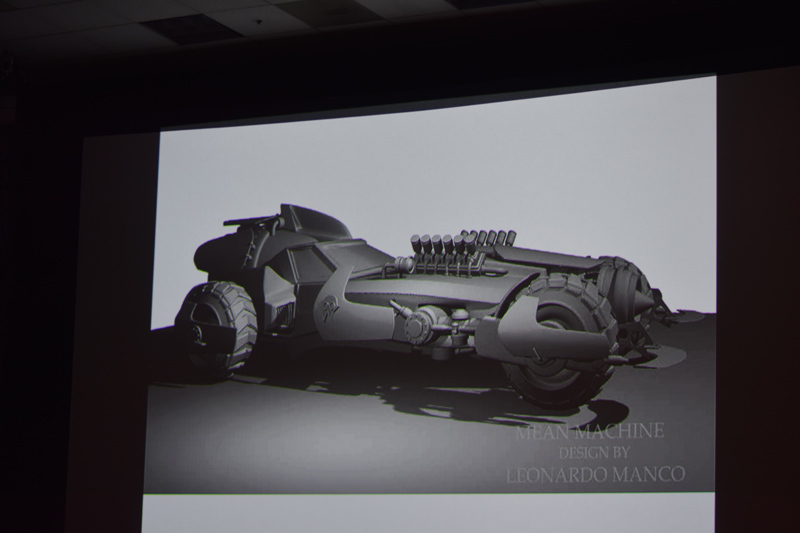 When artist Leonardo Manco came on board he wanted to add to and change some of the design ideas for the vehicles and they went in an entirely new direction. 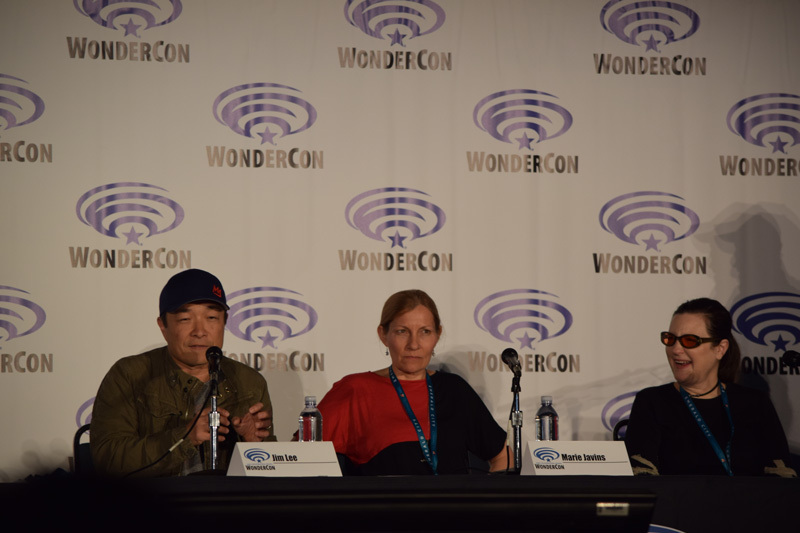 Then his character designs needed to fit the cars and so things kept getting pushed farther to the edge but along with writer Ken Pontac who has written for animated series such as Happy Tree Friends and Mucha Lucha made sure that while the visuals were farthest from the original show that the concept would still be at the heart of the book. 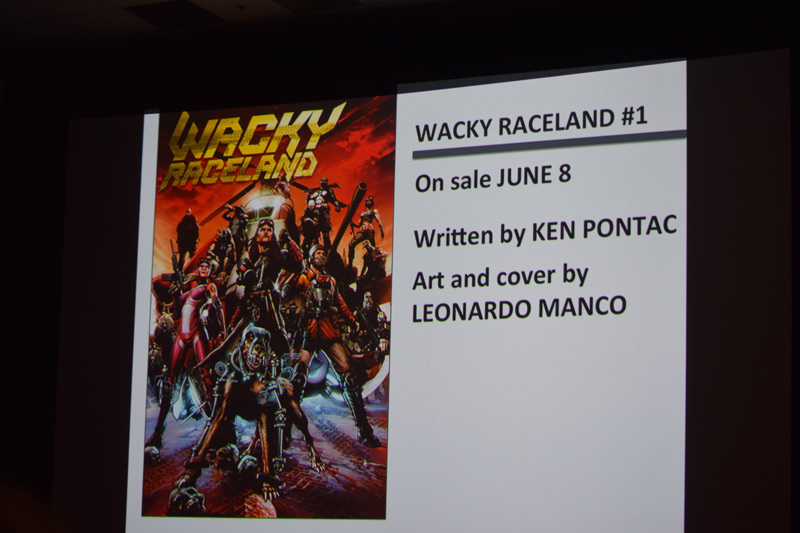 Javins said that Wacky Race Land is the weirdest one of the titles. 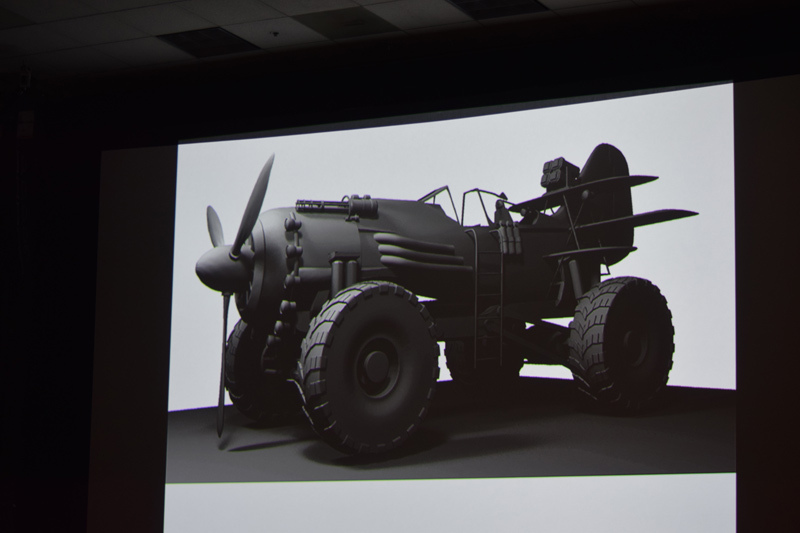 The concept of the book is that whoever wins the race across the wasteland gets to enter the last safe-haven for mankind, with the catch that no one is allowed to die along the way. 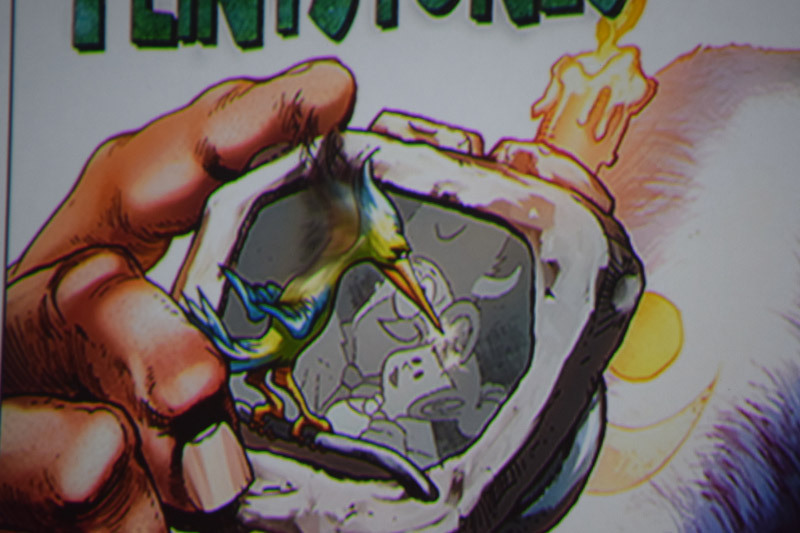 There was a Q&A it was revealed with a nod and a wink that Conner and Jimmy Palmiotti were going to be doing a Jetsons comic in the future. 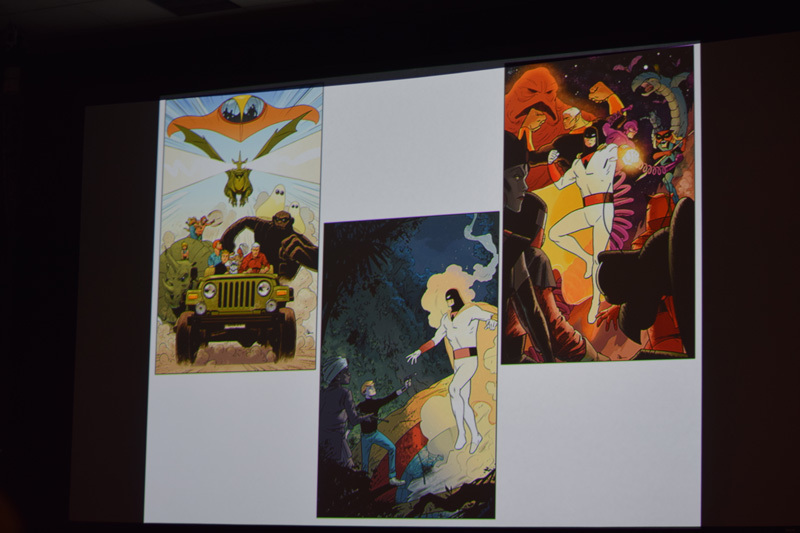 There were many fans who asked about series from the 1990’s like Pirates of Dark Water and Swat Cats might be considered but Didio said that they were going to stick to the 1960’s to 1970’s period of shows for the books. 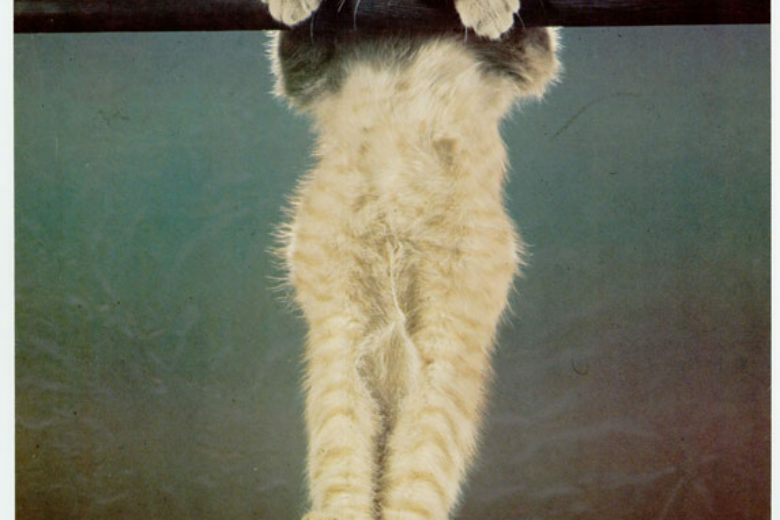 The question of the talking animal shows such as Yogi Bear and Huckleberry Hound might be books. 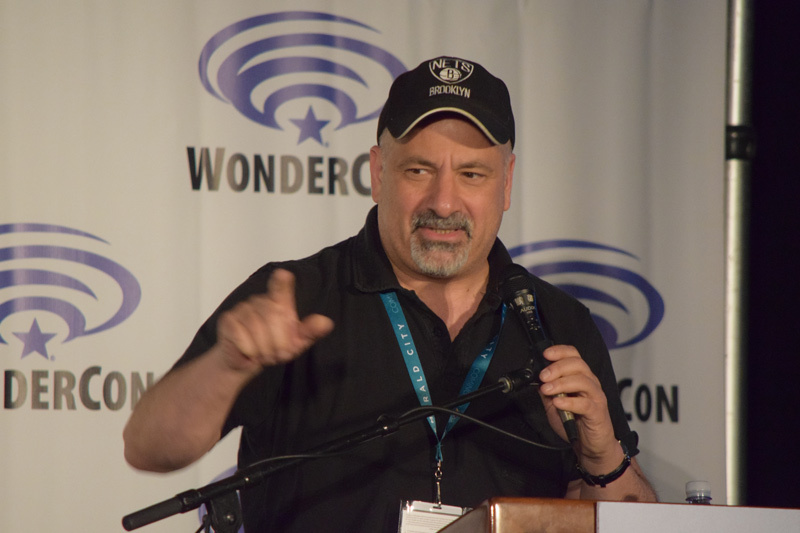 Didio said that they are trying to get some ideas for those types of books and he is a huge fan of Top Cat and would love to publish that. 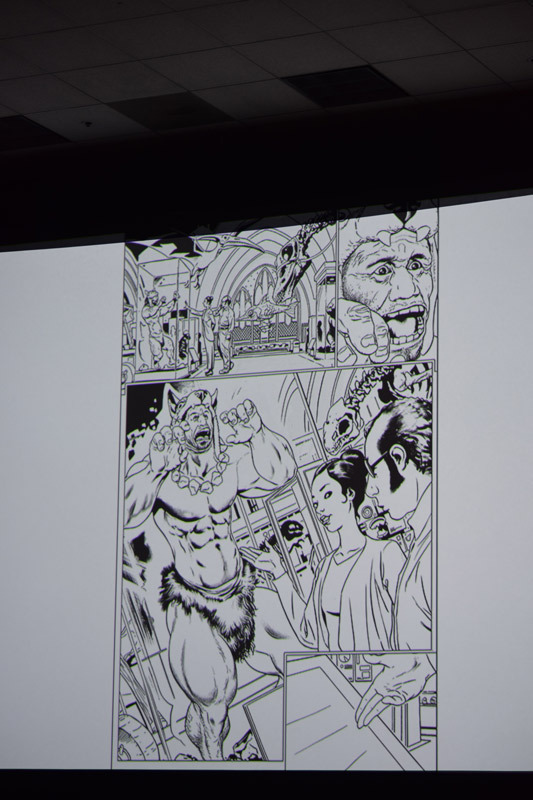 Conner asked if Magilla Gorilla was a Hanna-Barbera property and Didio said yes and she got very excited and said that she would love to do a book about him. 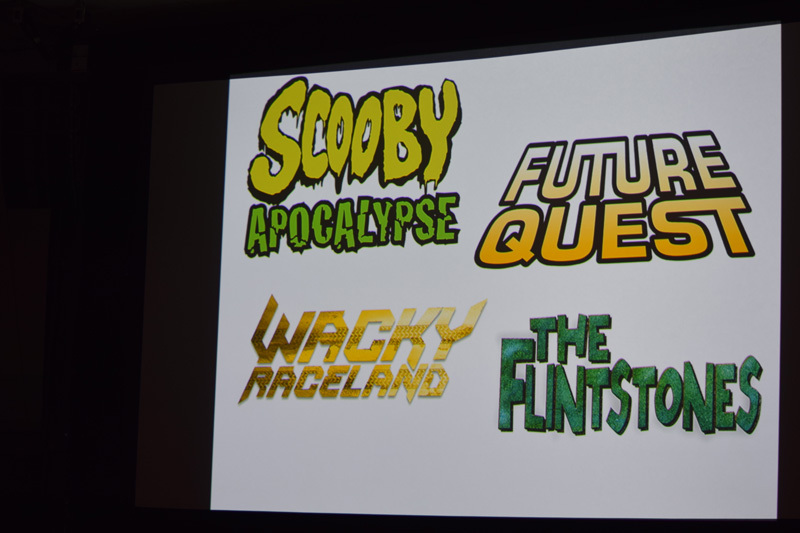 Lastly Lee spoke about how all of the Hanna-Barbera comic could fit into a shared universe. 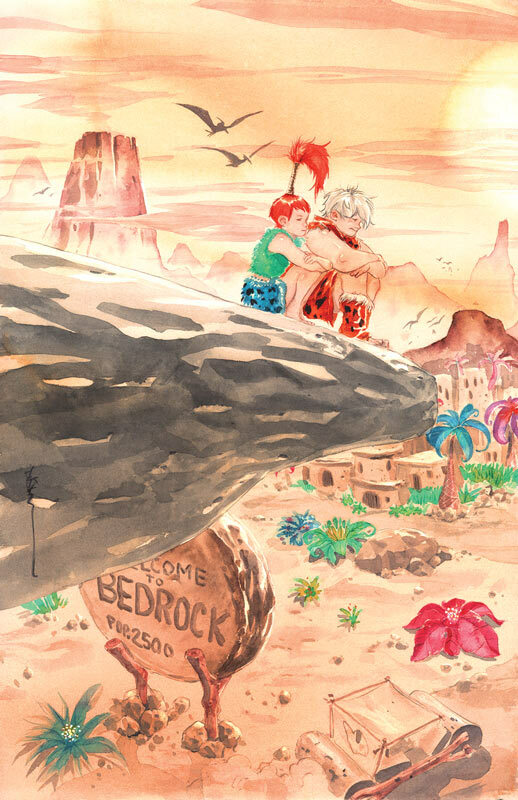 He said that while that seemed wild but that they are all in different time and places but there’s a lot of redheads (Wilma, Pebbles, Daphne, etc.) 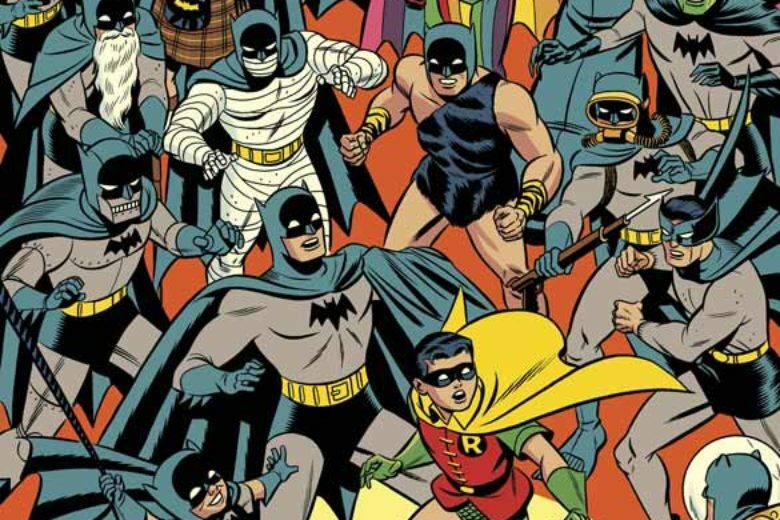 so those characters could all be of the same lineage. 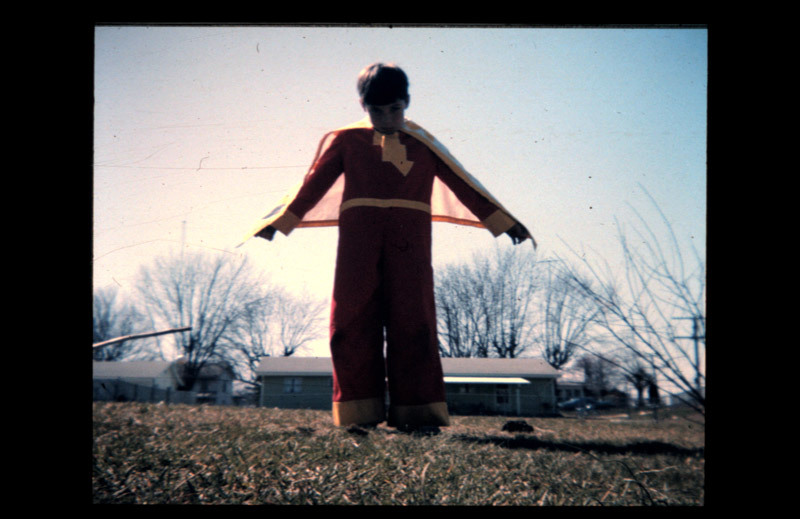 He said that he had a theory that the Jetsons would travel back in time to stop the apocalypse that had to make everyone to have to live in the sky. 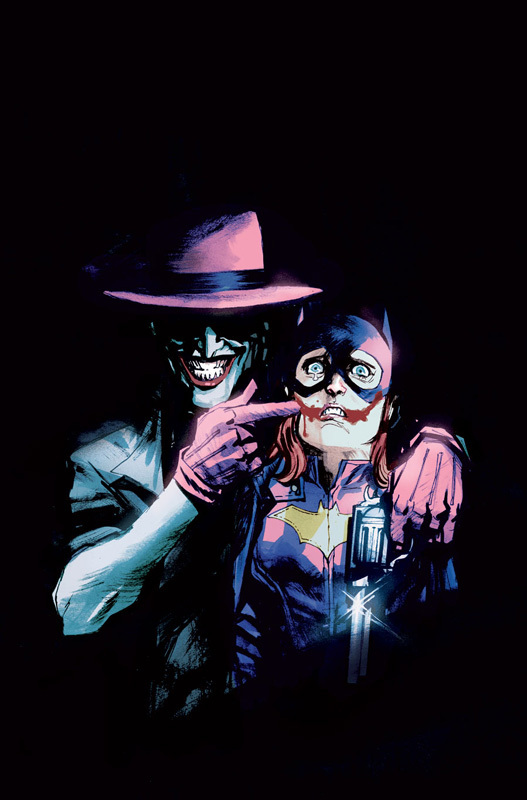 The one thing that I took away from the panel was the sheer enthusiasm that Didio and Lee have for the books and that they were very adamant that while they seem to be different from the shows that inspired the comics the core concepts would always be there. 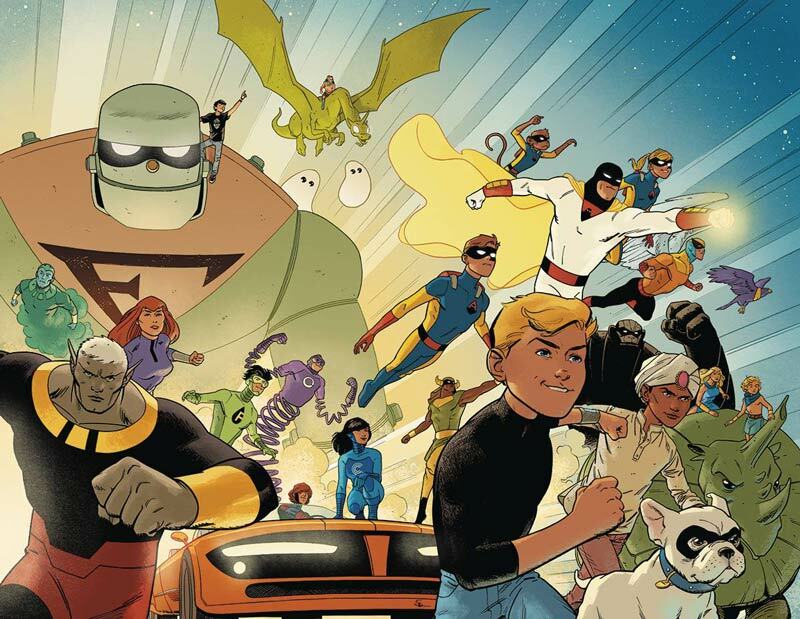 I am a huge fan of the 1960’s to 1970’s Hanna-Barbera period and while I hold them near and dear to my heart I am excited to see what these new comics will be. 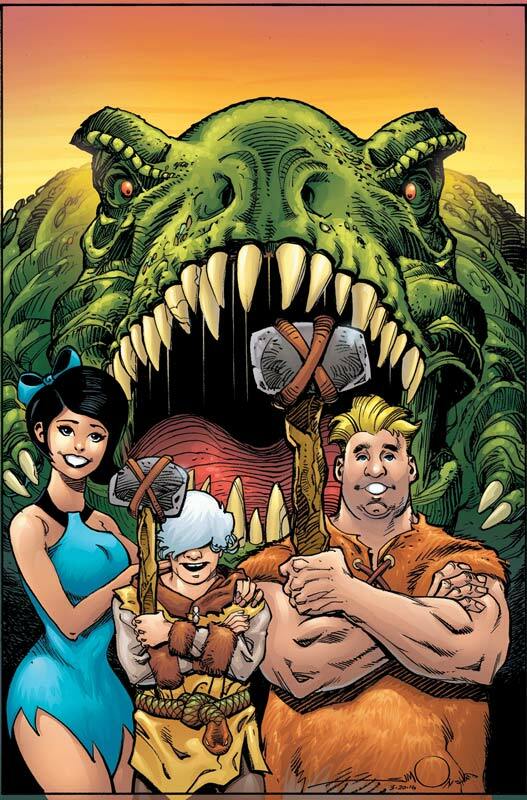 While I have no doubt that Future Quest is the strongest of the group, after hearing and seeing art from The Flintstones I am less apprehensive about that book now. 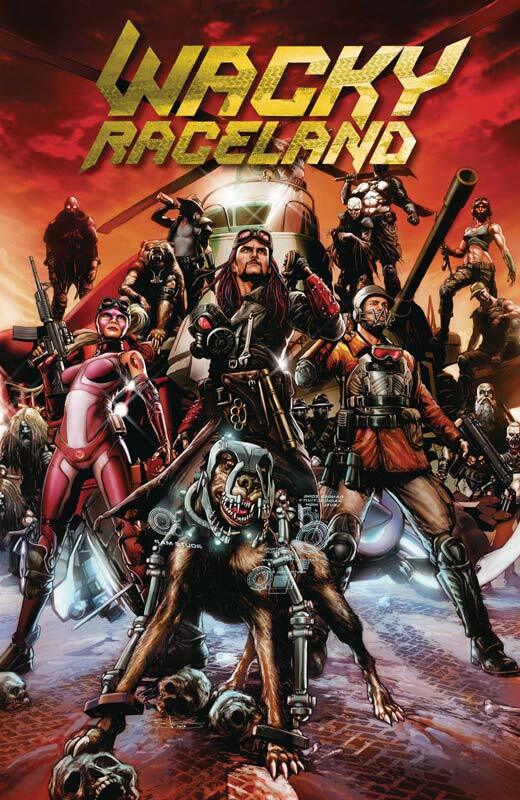 While the Wacky Raceland seems really out there both in concept and visually I think that it looks really amazing and might be the biggest surprise. 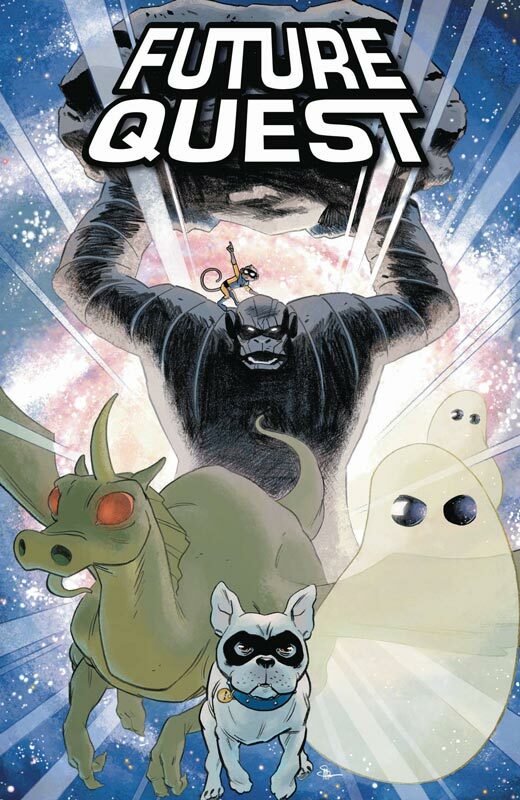 I do hope that the books both are high quality and if they are that they sell well because the Hanna-Barbera catalog is both very rich and very deep and there is a lot of books that could come out of this. 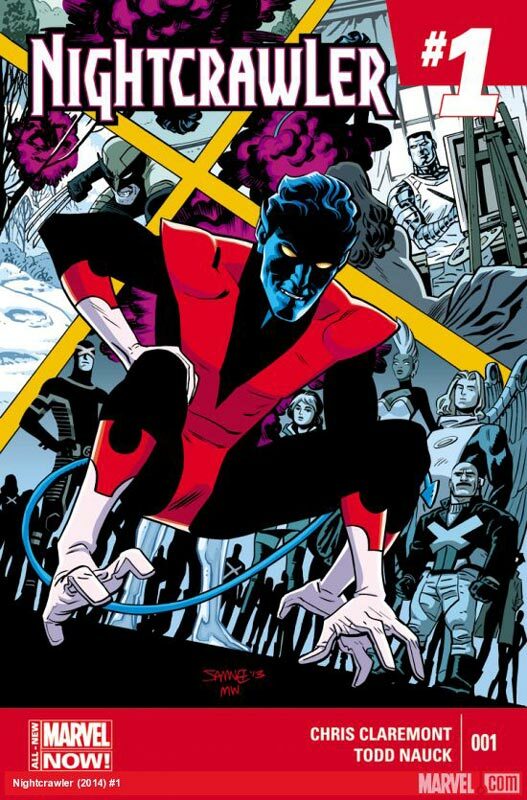 It sound like there is a lot of comic industry talent that are banging on DC door to pitch ideas for book based on series and that is very exciting and intriguing. 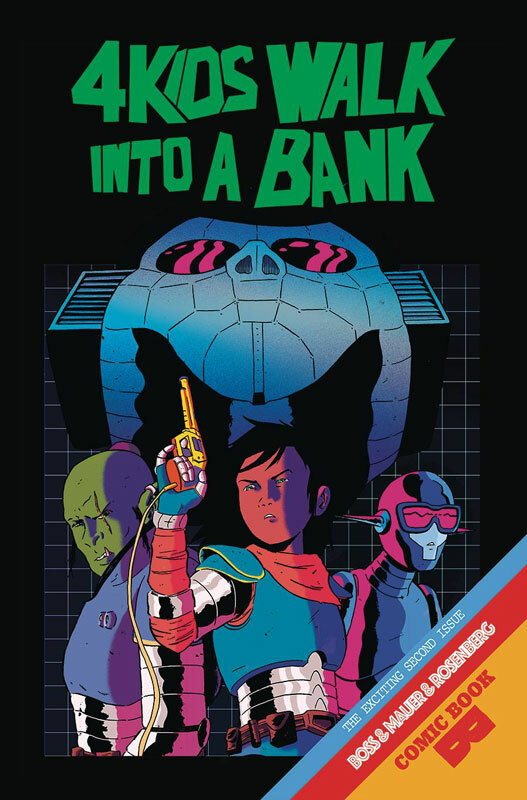 I also like the idea that the books will have an aspect of an all ages type book that could capture the elusive teenage and young adult audience that is very challenging to reach in the comic market. 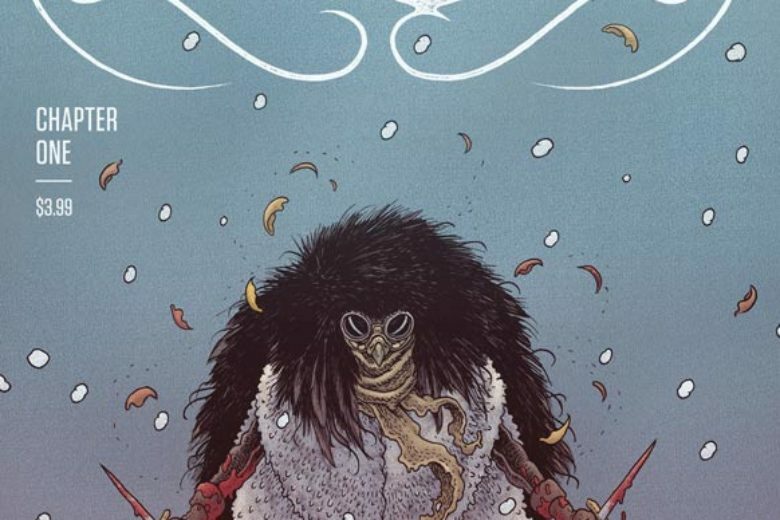 While there has been a lot of criticism from the internet community after this panel I think and hope that they are proved very wrong about these books. 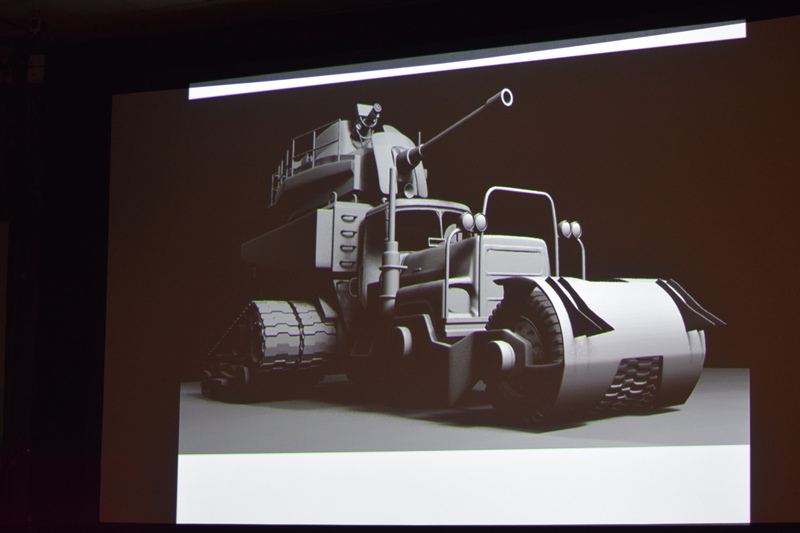 Below are some more pictures from the panel and an gallery of variant cover artwork for the books.